Stick a wig on it? Give it some new trousers? Launch it on a new career as an edgy photographer? There are lots of ways to jazz up a product or relaunch yourself. This 2008 release, with, the press tells us, all of the original member (Steve Howe now having left be with Yes full-time and hot young gunslinger Sam Coulson on board for the mature sounding 'Gravitas' album) and being released on Asia's own imprint. The album is good alright, this opportunity has allowed a reappraisal of a perhaps frosty first view which declared the maturity, the syrupy nature of some of the work here to influence the view. 'An Extraordinary Life' has a beautiful melody and 'Never Again' a pumping quality which enfold you and simply will not let you go; the Asia gents do this so well. 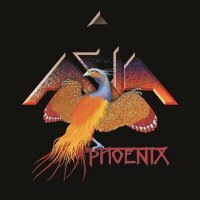 'Phoenix' has a bit more too, surprises in the form of 'Sleeping Giant/November Way Back/Reprise', which favour us with a bit of Proggy meandering among the softer Rock goodness; they do "grown up" and effecting so well and if there's a concern about a gentle perambulation rather than a jog, there is no getting away from the nagging melodies, particularly apparent on this album. This is not why we're here though. We're here because this is being presented with a whole new disc. When we say a whole new disc, it's new in the sense that 'Only Fools And Horses' is new on TV Gold when it's programmed on Monday instead of Thursday. It's the US version of the album, which is so close to the original in both programming and sound that you could listen to either and get very similar things from either. The sound may be a little brighter, which strangely brings an even lighter touch to the generally genial music, but does push John Wetton's seasoned and heartfelt voice to the fore. Apart from that, it's like watching Rory Bremner perform; just like the real thing, but does it really matter? We have to attack the thorny issue of cash. They want you to spend it. You'll be looking askance in these austere times; there are two acoustic tracks, 'I Will Remember You' and 'An Extraordinary Life' which are both acoustic re-mixes and well done by very experienced troubadours, and the discs are housed in an attractive digi-pack with booklet. But really? One for completists only, this particular version of 'Phoenix' doesn't really get off the ground.